The state of New Hampshire is going after a high-level drug dealer out of Lawrence accused of causing the death of a Rochester resident. This is the first time local law enforcement has brought charges against someone out of state in connection with a New Hampshire drug overdose death. A multi-million dollar donation has been made to help pregnant women and babies in New Hampshire who are impacted by substance abuse. The gift was made anonymously to the New Hampshire Charitable Foundation. Nashua Police Lt. Brian Kenney told the Board of Aldermen on Tuesday night that this program is working. He says operations through Granite Hammer have led to 200-plus arrests and a 25 percent drop in drug overdoses in the city. Needle exchange programs are now legal in New Hampshire. But since the state is providing no financial support or other resources for them, some groups are wondering how to go about starting one. One group in Strafford County is taking on that guiding role. When it comes to drug prevention, education efforts tend to start in middle or high school. But advocates say it should start much sooner. Studies show people with troubled childhoods are two to four times more likely to use drugs later in life. A new state law loosening the penalties on marijuana possession officially took effect this weekend. Police departments around the state are worried some residents may not fully understand what the change means. U.S. Health and Human Services Secretary Tom Price made a quick trip to New Hampshire Thursday afternoon to announce $200 million in federal grants targeting community health centers, to increase access to mental health and opioid abuse services. Ten New Hampshire recipients – nine health centers and the City of Manchester – are set to receive about $175,000 each as part of the grant program. 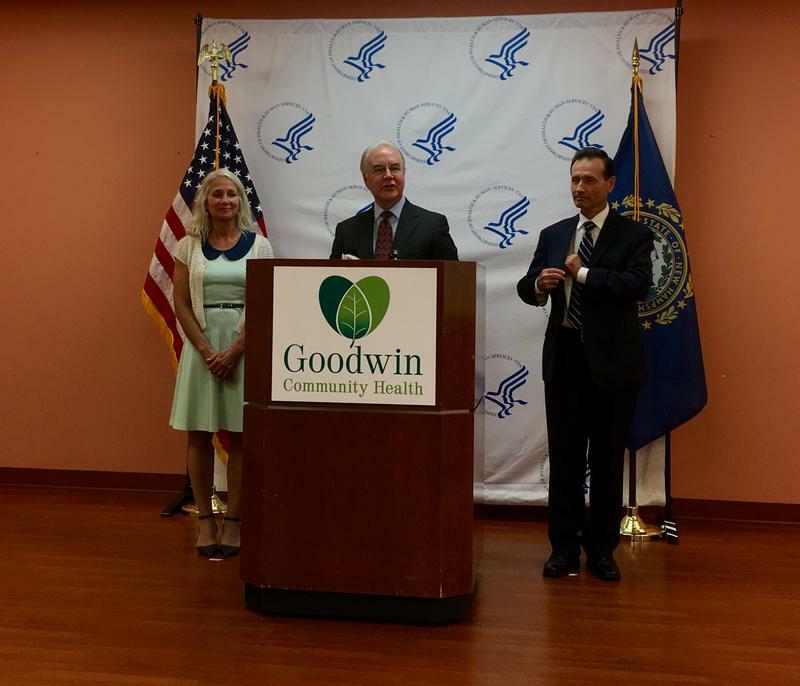 Speaking at one of those local recipients, Goodwin Community Health in Somersworth, Price said this is just one of several steps the Trump administration plans to take as part of a national effort to address the opioid crisis. Price was referring to a statement made by President Trump last month, calling the opioid crisis a “national emergency.” Since then, the federal government hasn’t followed through on a formal emergency declaration, which would carry with it additional funding and resources. Earlier this year, some local recovery advocates expressed disappointment that Trump had not given the opioid crisis – and its effects on New Hampshire – much attention since taking office, despite pledging to do so during his campaign. Officials at Goodwin Community Health say they plan to put part of its new federal grant toward capital improvements, building out space for mental health and substance misuse treatment. Some is also going toward hiring a psychiatrist and recovery support workers. The state’s Chief Medical Examiner is retiring after two decades on the job. When Dr. Thomas Andrew assumed the role in 1997, the office's caseload was 900 a year. That number has since doubled, in large part because of the state’s ongoing opioid crisis. Andrew will be stepping down on October 1st and Deputy Chief Jenny Duval will take over. Last month, New Hampshire became the latest state to go after Purdue Pharma, alleging the company’s marketing practices were partially to blame for the state’s opioid epidemic. Now, the city of Manchester has followed suit. Communities across New Hampshire are holding vigils Thursday evening to honor the hundreds of lives lost in the state's drug epidemic. By next fall, the North Country will have a new residential drug treatment facility offering 32 beds. Construction is expected to start next month. Officials in Merrimack County are currently screening candidates for its new drug court program, which is set to start up next month. Prosecutors in the county will tell you the number of drug cases they’re seeing are only going up. The Office of the Chief Medical Examiner is projecting at least 466 people will die from drug overdoses by year’s end — not quite as many as last year’s record of 486, but close. Starting in November 16 AmeriCorps volunteers will be coming to New Hampshire to work with people fighting drug addiction in the state. These volunteers will serve as community health workers in Lebanon, Nashua and Strafford County.